Safety Agency Mark – Is it required for medical electrical equipment? This article explains when a safety agency mark is required for electrical medical equipment for products sold in the USA. What is a safety agency mark? Examples of a safety agency mark include UL, CSA, Intertek, SGS Q-mark and other marks indicating that a recognized testing lab completed the electrical safety testing and the device passed the testing. Health Canada requires a safety agency mark to certify approval by a lab that is accredited by the Standards Council of Canada (SCC). However, device manufacturers are frequently unclear what the requirements are in the USA for electrical medical equipment regarding a safety agency mark. Leo Eisner of Eisner Safety was kind enough to answer this question. The simple answer is yes. In the US there is a requirement for equipment in the workplace to have a NRTL Safety Agency Approval Mark for the applicable category on the device to meet OSHA requirements. The requirements for NRTL approval of electric equipment (or medical electrical equipment) are in 29 CFR 1910.303(a) and 29 CFR 1910.307(c). Because of these requirements, most electric equipment used in the workplace must be NRTL approved. Biomeds maintain and track all the medical equipment in hospitals and clinical environments, and the biomeds usually insist upon an Agency Approval Mark. However, the biomeds may not be aware of the NRTL requirements. A NRTL is a Nationally Recognized Test Lab that is approved or authorized by Occupational Safety & Hazard Administration (OSHA) for specific device test standards (i.e UL 60601-1 [National deviation version of IEC 60601-1, 2nd ed. medical electrical equipment standard] and / or AAMI ES 60601-1 [National deviation version of IEC 60601-1, ed 3.1], among many other standards) to allow a US Mark to be placed on approved devices that meet the applicable standard. Not all NRTL labs can test to the listed medical electrical standards for medical electrical equipment to allow a US mark be placed on devices. You need to go to the OSHA NRTL site to verify that the test lab can issue a US mark. Within the labs link you can find which standards each test lab is allowed to issue US Marks for. This blog summarizes updates on electrical safety standards for medical devices-IEC 60601. OSHA finally approved some Nationally Recognized Test Laboratories (NRTL) to AAMI ES 60601-1 (equivalent to IEC 60601-1 edition 3.1 or 3rd ed + A1). Leo Eisner posted a blog summarizing this change (http://bit.ly/OHSA-NRTL-Approval-Update) on January 7, 2015. The blog identifies which labs can issue NRTL Marks and which test labs have OSHA approval in progress. UL 60601-1 is still an approved standard that an approved NRTL can issue a NRTL test mark to, but a few of the NRTLs are now approved to issue a NRTL Mark to AAMI ES 60601-1 3rd edition + Amendment 1. The best place to confirm if a Safety Test Lab is an approved NRTL for your medical device is by confirming the notifications published in the U.S. Federal Register. You can also visit the OSHA NRTL website (http://bit.ly/OSHA-NRTL), but the OSHA website is updated less frequently. Eventually, UL will formally announce withdrawal of UL 60601-1, and OSHA will take steps to withdraw that standard from their list of Approved Standards. On January 14, 2015, Leo Eisner posted a second blog (http://bit.ly/IEC-60601-2-52-amd1-ed1) on the topic of IEC 60601-2-52 Medical beds as a pre-release. He discusses the actual changes between the 1st edition and 1st edition + A1. This version is the pre-release before the updated Standard is issued as an International Standard (IS), and it is currently available as a Final Draft International Standard (FDIS). IEC website (http://bit.ly/buy-IEC60601-2-52-amd1-ed1) states: “By purchasing this FDIS now, you will automatically receive, in addition, the final publication.” The voting period ended on February 13, 2015, and the FDIS should be published shortly after (forecasted to be published on March 27, 2015). I find this new symbology particularly interesting, because there are many medical devices where users frequently select the incorrect size for the patient. Consistent internationally recognized symbology for weight and height would be helpful for these devices, and bariatric specialty devices could benefit from the use of the last symbol. If you need additional support for any of the IEC 60601 series of standards, please contact Rob Packard by email or phone (+1.802.281.4381) to discuss your specific needs. In this blog, “IEC 60601-1 patient applied parts for Medical Electrical Equipment-Notes 1-2-3,” the author uses many figures to explain critical concepts. In IEC 60601-1, Figures 3 and 4 (shown below) are used to show where different parts of ME EQUIPMENT are located, and to help explain some of the defined terms in a pictorial way. In both figures, the APPLIED PART is intended to come into contact with the PATIENT. Figure 3 shows a CLASS I medical device as per sub-clause 3.13. The device is PROTECTIVELY EARTHED (i.e., grounded), in addition to providing BASIC INSULATION. Figure 4 shows a CLASS II medical device per sub-clause 3.14. The device is not PROTECTIVELY EARTHED. Instead, Figure 4 shows how the design uses two levels of protection, which is a basic tenet of the IEC 60601-1 standard. The two levels of protection used is either DOUBLE or REINFORCED INSULATION. Figures A.1 to A.7 provide examples of the way APPLIED PARTS and PATIENT CONNECTIONS are identified in order to apply the requirements for PATIENT LEAKAGE CURRENT and PATIENT AUXILIARY CURRENT. APPLIED PART circuits can provide isolation to other parts of the circuitry in the medical device, and these figures present several options for compliance with SPACINGS (i.e., CREEPAGE and AIR-CLEARANCE), DIELECTRIC WITHSTAND (i.e., HiPot test) and INSULATION requirements. The following discussion is limited to Figures A.1 and A.2. For additional information about Figures A.3-A.7, purchase a copy of IEC 60601-1, edition 3.0 (http://bit.ly/IEC60601-1) or edition 3.1 (http://bit.ly/IEC60601Consolidated). 3) the PATIENT CONNECTIONS consist of the ECG electrodes, which are part of the same function of the APPLIED PART. 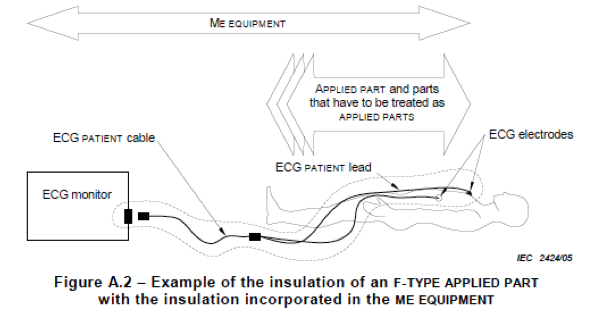 Figure A.2 below shows the required F-TYPE APPLIED PART insulation incorporated in the medical device itself. The components within the dotted line form the PATIENT circuit. Sub-clause 4.6 and Annex A, sub-clause 4.6 provide additional details that apply to the following paragraph below. Parts of medical devices that are not APPLIED PARTS, but which touch the PATIENT during the NORMAL USE of the device, may need to be treated as APPLIED PARTS. In this case, the part shall not be marked as an APPLIED PART. A RISK ASSESSMENT PROCESS needs to be conducted to determine whether the parts that come in contact with the PATIENT, but aren’t APPLIED PARTS, should meet the requirements of APPLIED PARTS. Figures A.4 through A.7 all have a statement that roughly states: “The application of RISK MANAGEMENT might identify some parts of the device/system as having to be treated as APPLIED PARTS because of the probability they will come in contact with the PATIENT.” If your RISK ASSESSMENT determines that sub-clause 4.6 is applicable, then all applicable requirements and tests for APPLIED PARTS should be applied to the parts identified in the RISK ASSESSMENT—with the exception of sub-clause 7.2.10 for marking of APPLIED PARTS. These requirements apply to this standard and the relevant collateral and particular standards in the 60601 series of standards. An example of the type of parts that could fall under sub-clause 4.6 could be computer system interface cable (I/O). A PATIENT CONNECTION is part of the APPLIED PART as shown in figure A.1. Sub-clause 3.78 defines a PATIENT CONNECTION as: “Individual point on the APPLIED PART through which current can flow between…PATIENT and ME EQUIPMENT in NORMAL…or SINGLE FAULT CONDITION.” In this example, the conductive part of the ECG electrode is considered the PATIENT CONNECTION. IEC 60601-1 assumes the PATIENT is earthed as a NORMAL CONDITION per sub-clause 8.5.4, 4th dashed item, because there are many opportunities in normal operation of medical electrical devices where the PATIENT can accidentally become grounded. Therefore, some PATIENT LEAKAGE CURRENT tests are configured with the LEAKAGE CURRENT measuring device (see Figure 12) directly connected to earth on one side and passing thru the measuring device to the APPLIED PART circuit that is being tested. The boxed in area in Figure 15 is the portion of the PATIENT LEAKAGE CURRENT test measuring circuit that is connected from the PATIENT CONNECTION (item 4) thru the measuring device to earth (left hand corner of figure—symbol sometimes called “upside down Christmas tree”). Leo Eisner is the owner and founder of Eisner Safety Consultants (http://bit.ly/LeoEisner). If you need help wth IEC 60601 compliance, email Leo directly at Leo@EisnerSafety.com or call him at +1 (503) 244-6151. You can also connect on LinkedIn at: http://bit.ly/ConnectwithLeo. This article reviews the IEC 60601-1 definition of patient applied parts for medical electrical equipment. It includes examples, as well. Classification of medical electrical devices was discussed in a previous blog (http://bit.ly/IEC60601-FAQ), while this article focuses on APPLIED PARTS—one portion of the “Protection Against Electric shock” classification in sub-clause 6.2 of IEC 60601-1. ALL CAPITAL LETTERS identifies a defined term for the IEC 60601 series of standards within this blog. All clause references in this blog are to both IEC 60601-1:2005 (3rd edition) and IEC 60601-1:2005 (3rd edition) + Amendment 1:2012 (http://bit.ly/IEC60601-1am1), or the consolidated version IEC 60601-1:2012 ed. 3.1, but the actual text comes from edition 3.1 (http://bit.ly/IEC60601Consolidated). An APPLIED PART can be an blood pressure cuff, or an SpO2 sensor of a multi-parameter monitor, the table top of an MRI and many other parts of ME EQUIPMENT that manufacturers intend to come into contact with a PATIENT during NORMAL USE. Electrical-medical devices can have different types of APPLIED PARTS or more than one of the same type (e.g., multi-parameter monitors frequently have temperature sensors and blood pressure monitoring components in the base configuration and other APPLIED PARTS can be added). As discussed in the previous blog (http://bit.ly/IEC60601-FAQ), APPLIED PARTS can have six different classifications: TYPE B, BF, or CF (and each can be DEFIBRILLATION PROOF). Each of these classifications also has an associated symbol. The requirements for an APPLIED PART are more stringent because it has to be assumed that the PATIENT’s immune system is depressed. So, the probability of HARM is increased for a sick PATIENT, rather than for a healthy OPERATOR. Therefore, the standard aims to reduce the severity of HARM by requiring more stringent limits upon LEAKAGE CURRENTS. The computer equipment standard (IEC 60950-1 Information Technology Equipment Standard) applying to your home or business computer allows for higher limits for LEAKAGE CURRENTS because the computer equipment standard assumes the user is healthy—just like medical equipment operators. The level of HARM to a PATIENT by an APPLIED PART can be adversely affected if a PATIENT is not conscious (e.g., during general anesthesia), because the PATIENT may be unable to react while they are unconscious. Therefore, understanding a device’s intended use (i.e., what the device is intended to do), and indications for use (i.e., environment of use, part of the anatomy and intended population), is critical when you are conducting RISK ANALYSIS and USABILITY ANALYSIS of a device. The sample figures related to the first note, Figures 3 & 4 and figures A.1 to A.7 of Annex A, show APPLIED PARTS in different system configurations. These figures provide guidance and a rationale for why and what is happening. The second note is important because any part that necessarily comes into physical contact with the PATIENT, for the equipment to perform its function, will also need to be tested as if it were an APPLIED PART, but it will not be allowed to be marked as such. The third note regarding PATIENT CONNECTION, in sub-clause 3.78 & Annex A for 3.78, is the part of the APPLIED PART that is intended to contact the PATIENT that current flows through. The next blog will review all three notes in greater detail. If you need help with the IEC 60601 series of Standards, email Leo Eisner (http://bit.ly/ConnectwithLeo) directly at Leo@EisnerSafety.com, or call Leo at +1-(503)-244-6151. He is the owner and founder of Eisner Safety Consultants (http://bit.ly/LeoEisner). IEC 60601 medical electrical equipment classification frequently asked questions are discussed in this blog. *Note: ALL CAPITAL LETTERS identifies a defined term for the IEC 60601 series of standards within this blog. What are the various classifications that are used in IEC 60601-1, edition 3.1? – The table at the beginning of this blog posting identifies the five parts of the Classification section. Each classification is described in more detail below. Why do I need to classify my product for IEC 60601-1, 3rd ed.? – The standard says you have to classify “…ME EQUIPMENT, or parts thereof, including applied parts…” as noted in sub-clause 6.1. But a more practical reason you would want to classify your products that fall under the scope of IEC 60601-1 (http://bit.ly/60601scope) is it is a helpful tool in identifying the requirements that apply to the device, and helps us in determining the test plan for the product to be tested. What is an applied part? – The definition of an APPLIED PART is in sub-clause 3.8 of the standard. It states that an APPLIED PART is “part of ME EQUIPMENT that in NORMAL USE necessarily comes into physical contact with the PATIENT for ME EQUIPMENT or an ME SYSTEM to perform its function.” So, it can be a cable, lead, electrode, or many other parts of an ME EQUIPMENT, or an ME SYSTEM that is intended, by the manufacturer, in its NORMAL USE to come in contact with the PATIENT. What are the classifications for Protection Against Electric Shock? –There are two classifications that fall under sub-clause 6.2 of the standard: 1) the power source, and 2) applied parts. Power sources can be an external power source, and is either classified as a class I or class II ME EQUIPMENT or an internal power source, which is classified as INTERNALLY POWERED MEDICAL EQUIPMENT. Power Sources – External Class I, External Class II or Internal – Class I provides its protection against electric shock by having an additional safety ground (known as PROTECTIVELY EARTHED) that is connected to the internal and/or external conductive parts (metal) of the power source. Class II provides its protection against electric shock by having an additional layer of insulation beyond that of BASIC INSULATION (a single layer of insulation), and is provided either by DOUBLE INSULATION (two layers of insulation) or by REINFORCED INSULATION (the same as DOUBLE INSULATION, but as one insulation system that is twice as thick, typically). An internal power source is typically a battery. Applied Parts – B, BF, CF (also defibrillation-proof) – The second classification for protection against electric shock is for APPLIED PARTS. APPLIED PARTS are classified in one of six ways, and a product can have more than one type of APPLIED PARTS. The classifications for applied parts are type B, BF or CF. Each of these 3 classifications can be DEFIBRILLATION-PROOF APPLIED PARTS for a total of 6 classifications. There are 6 separate symbols for these APPLIED PARTS, and they are noted in the table below, which comes from Table D.1 of Annex D of the standard. Why do we have classifications for protection against electric shock? – Protection against electrical shock is important because electric shock is one of the main areas of concern in most electrical safety standards as the shock hazard can cause harm to the OPERATOR or PATIENT or even death. The main reason is we want to protect the PATIENT who may have a depressed immune system from getting an electric shock that could injure or potentially kill the PATIENT. The depressed immune system makes them more likely to be harmed by an electric shock. We also want to consider the OPERATOR of the device but they should not have a depressed immune system so the worst case to consider is the PATIENT. What are the classifications for protection against harmful ingress of water or particulate matter? – There are a wide variety of these classifications (per sub-clause 6.3 of IEC 60601-1) and they are based on the standard IEC 60529 (http://bit.ly/IEC60529) titled “Degrees of protection provided by enclosures (IP Code)”. The IP Codes range from IP00 to IP68, which means respectively no protection against contact and ingress of objects along with not being protected against liquid ingress (IP00) to No ingress of dust; complete protection against contact along with protected against the effects of continuous immersion in water (IP68). Table D.3, 2nd row (copied below), in the IEC 60601-1 standard details all the classifications in a short summary list. Why do we have classifications for protection against harmful ingress of water or particulate matter? – The reason we want to protect the ENCLOSURES of the device is to protect against ingress of these items (liquids and particulates) so they reduce the possibility of causing a hazard, such as a short based on bridging the electronics of the device causing potentially a fire hazard, a shock hazard, a thermal hazard, or other potential hazards. What are the classifications for methods of sterilization? – For any part of the ME EQUIPMENT or its parts intended to be sterilized needs to be classified per the requirements of sub-clause 6.4. Classifications are based on the types of sterilization methods used in the medical device industry currently such as ethylene oxide (EtO), irradiation by gamma radiation, and moist heat by autoclave. The standard also mentions “…other methods validated and described by the MANUFACTURER.” Classification of sterilization methods is critical, because each sterilization method presents unique environmental conditions that can adversely affect ME EQUIPMENT. For example, EtO Sterilization frequently includes a vacuum cycle which may not be suitable for embedded batteries. Why do we have classification for the suitability in an oxygen rich environment? – The RISK of fire in an OXYGEN RICH ENVIRONMENT is considered to exist when a source of ignition is in contact with ignitable material (i.e., flammable materials) and there is no barrier (i.e., a solid enclosure) to prevent the spread of fire. What are the classifications for modes of operation? – There are two modes of operation described in IEC 60601-1, edition 3.1: 1) CONTINUOUS OPERATION, and 2) non-CONTINUOUS OPERATIONS. When a device is classified as non-CONTINUOUS OPERATION there is some type of duty cycle involved so the device is rated properly. A duty cycle means the device is rated to be on for a certain period of time and off for a certain period of time. Many times the duty cycle is required so a device may pass the EXCESSIVE temperatures in ME EQUIPMENT test in sub-clauses 11.1.1 & 11.1.2 so not to exceed the limits of the test requirements. If you have questions about this topic or need help with compliance to the IEC 60601 series of Standards, you can email Leo Eisner (http://bit.ly/ConnectwithLeo) directly at Leo@EisnerSafety.com or call Leo at +1-(503)-244-6151. He is the owner and founder of Eisner Safety Consultants (http://bit.ly/LeoEisner). What is the Scope of IEC 60601-1:2005 (3rd edition)? This blog will help you determine if and how the IEC 60601-1 Standard applies to your medical electrical product. Definitions, third-party testing, etc. discussed. One of the first questions clients ask before a project starts is, “Does this medical electrical product fall under IEC 60601-1?” Another common question clients ask is whether IEC 60601-1 applies to battery operated medical devices. To answer these questions, we must review and understand the scope (sub-clause 1.1) of IEC 60601-1 to determine if and how the IEC 60601-1 Standard applies to a medical electrical product. *Note: ALL CAPITAL LETTERS identifies a defined term for the IEC 60601 series of standards within this blog. “IEC” is an acronym for the International Electrotechnical Commission (http://bit.ly/IECwebsite). IEC is a non-profit, non-governmental international standards organization that prepares and publishes International Standards for all electrical, electronic and related technologies. All clause references in this blog are to both IEC 60601-1:2005 (3rd edition) and IEC 60601-1:2005 (3rd edition) + Amendment 1:2012, or the consolidated version IEC 60601-1:2012 (edition 3.1), but the actual text comes from edition 3.1.
and “…having an APPLIED PART or transferring energy to or from the PATIENT or detecting such energy transfer to or from the PATIENT…”. Note: The above definition aligns well with the definition for medical electrical devices in the European Medical Device Directive (http://bit.ly/M5MDD). From the definition above, we know that a device can have up to one power cord, or be hard wired to the building’s power by one power line, and/or be battery powered. We also need to understand the term APPLIED PARTS (sub-clause 3.8): “Part of…ME EQUIPMENT…in NORMAL USE necessarily comes into physical contact with the PATIENT for…” the device “…to perform its function.” Classification of the different types of APPLIED PARTS and other classifications (there are eight different classification criteria in the IEC 60601 Standard) need to be completed early in the process of setting up a test plan for design verification to determine the applicable testing requirements, and to develop an appropriate test plan. Examples of electrical medical products fitting the definition above are broad and include battery-operated thermometers, gamma imaging systems, endoscopic cameras and infusion pumps. IEC 60601-1 may also apply to many ACCESSORIES (sub-clause 3.3) used with ME EQUIPMENT. Design verification must confirm that design outputs (i.e., – product specifications) meet design inputs (e.g., – product must meet IEC 60601-1 requirements). Many projects don’t identify all the applicable IEC 60601 standards. This could cause multiple nonconformances during an audit by the national regulatory body (i.e., FDA, EU Notified Body), or that you don’t obtain approval to sell and distribute your device from the national regulatory body. A test plan, with multiple test protocols, is developed from the product specification. This test plan should identify all the requirements of the IEC 60601 series of standards, in addition to any other applicable standards and regulations that apply to the device prior to performing device testing. IEC testing can be performed by a third-party test house (i.e., – a safety certification agency, such as a UL, CSA, TÜV SÜD), an independent test lab (i.e., – Global EMC Labs, O’Brien Compliance Management, Medical Equipment Compliance Association), or the manufacturer can conduct the testing if they have proper equipment, trained personnel and a good understanding (i.e., – used the Standard on several projects, and successfully tested previous similar electrical medical device(s) by a third-party test lab, and been approved by a national regulatory body) of the standard(s). Design verification reports generated from the test process are either the applicable IEC 60601 and IEC 80601 series of standards test report forms (http://bit.ly/IECTRFs and http://bit.ly/80601Series), or the manufacturer’s generated test reports. If your company needs help with IEC 60601-1 gap analysis, preparation of the risk management file for the third edition, or training on the Standard, please contact Leo Eisner at: Leo@EisnerSafety.com. We are also developing a webinar series on IEC 60601-1, 3rd edition.